If the workplace is uncomfortable, one cannot concentrate on work. The first time we may feel difficult to hand but will mould to the way one feels appropriate. Change is necessary in everyone’s life, especially at work. Workplace change is very important for success. Even change in an organization, or organization structure or change in responsibilities, there is no need to feel disappointed to handle the change, go ahead with an optimistic attitude. 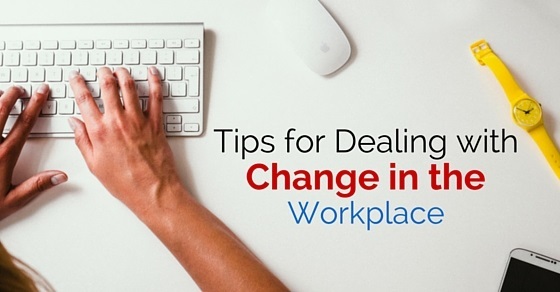 Here are few tips to deal with change in the workplace. If you are demoted from the position, then understand where you lack behind, what dragged you to the position, how to build confidence to work, join motivational programs and allow yourself to prove once again. Give an opportunity to show up your abilities and performance to the company. So all one need to do is keep the fear aside and try to adjust with the circumstances, and go with a positive attitude and taste the new experience, environment and knowledge. It is all about adapting to the change, with all your abilities and skills. Be flexible to the workplace, if you were asked to work in a shift which one is not comfortable, have a chat with HR, let them know your issues, if it is a compulsion, change your timetable and try to complete personal works in the week off or non-working hours. Learn time management and handle the change. Have proper training of new responsibilities from the education & training department of the organization. This will make your pressure down and will clarify your concerns. Focus on the upcoming goals and growth, then you will realize the necessity of change. One might fail at his first attempt in his new responsibility, you may lose interest to work. Do not avoid the meetings or off sites with co-workers, have a face to face meeting with your manager. Be with a positive attitude, move on with go-getter attitude, even try to attempt the worst condition in the workplace. Do not run away, dedicate your time to focus on getting things solved, push yourself to put all your efforts to bring the workplace to the normal condition by which you can work comfortably. One may not have experience in the field or with people when change is inculcated in the organization, so develop a plan for onboarding, go through this phase to remove the burden of fear. We may have many questions on how to handle the new challenge, so one must go through this training phase to adapt with the new life. Understand the benchmark from the previous employer who is being replaced. Collect the data from them, how did they go through this phase, how did they handle crucial situations, and how they won the hearts of everyone in the team. How did they meet the differences or gaps in the position. Change is the first step of growth for everyone. Understand the productivity of the organization neglecting individual personal interests. One will be responsible for the organization promotion or growth, so it is essential to understand the objective while accepting the workplace change. Build your interpersonal skills to work along with the team. Identify the opportunities with a clear vision, overcome the pressure or problems. Previous articleHow to Avoid or Have Less Awkward Conversations?